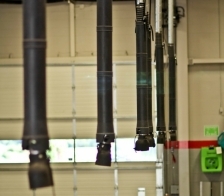 Garage Supply sells and installs above-ground exhaust extraction using overhead telescopic drops, or under-floor installations on new floors prior to pouring the floor. We can do installations from start to finish, including all ductwork, fans, and under-floor excavation for below ground installations using all of our own equipment and installers. Please see examples of both systems below.